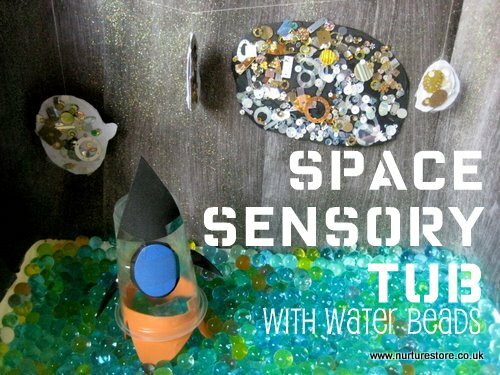 Following on from our water bead science experiment, this week we’ve been enjoying some imaginative space play in our water bead sensory tub. With rockets, aliens and a lunar landscape the children have been stretching their imaginations and playing in a totally different world. 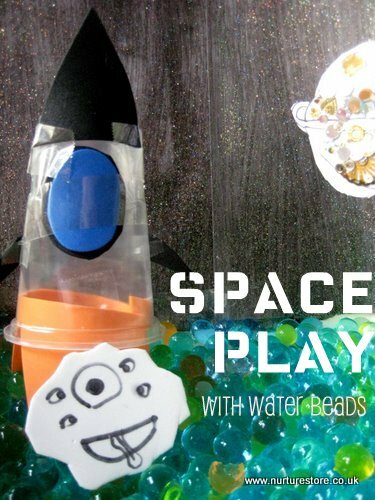 Here’s how they took their water beads into outer space. 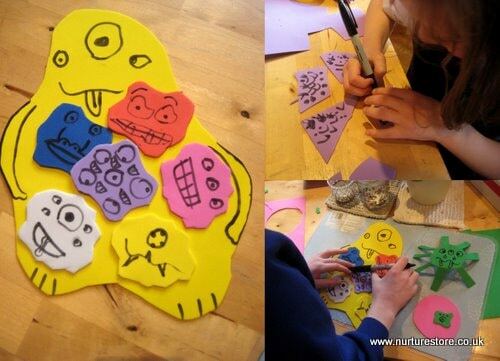 The children made some aliens to start off with. Although all the water is drained off the water beads once they’ve swollen to their full size the sensory tub still has some moisture to it, so we decided paper creatures would just go soggy after a while. We wanted to be able to add our characters to the water bead sensory tub so we decided to use permanent markers on foam sheets. To create the landscape for our space play tub we painted some pieces of card with black glitter paint, which gave us the perfect background. 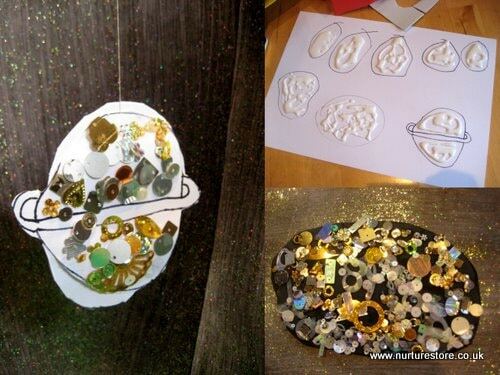 The children then drew some planets and moons on card, covered them with glue, and sprinkled on lots of gold and silver metallic foil pieces. They cut out the plants and used sticky tape to add a thread on to each one so our planets could really go into orbit. 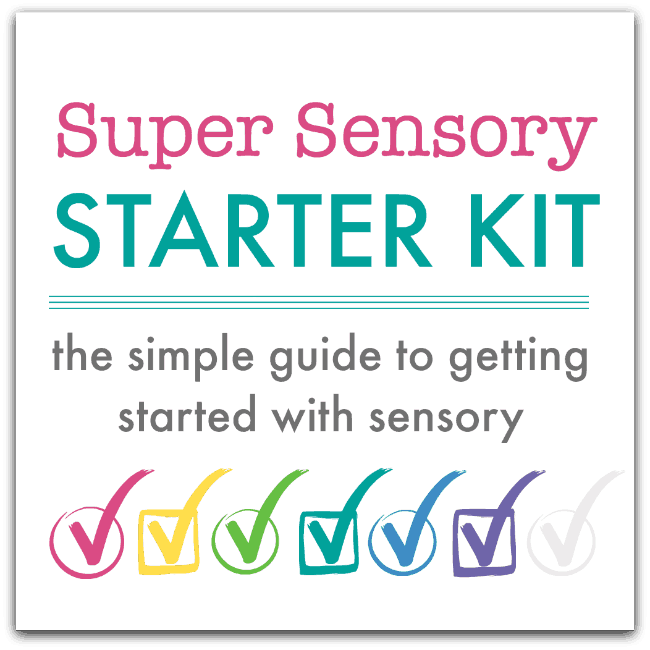 We use an under-the-bed storage box for our sensory tub, which we popped into an empty paddling pool so the children can sit inside and play and any stray water beads get caught before they skitter off across the room. We taped the black card around three sides of the tub to create our universe, with a cotton thread across the top to suspend our planets. B added a swirling Milky Way. Our rockets were made from plastic drink cups, with foam pieces stuck on – again, so that they could be safely used in the water beads without going soggy. The children loved the space play tub. 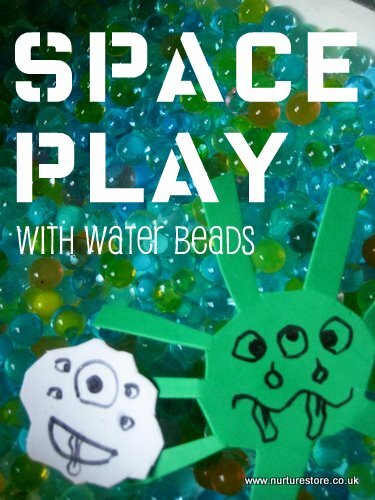 The sensory nature of the water beads work their magic and seem to relax the children but at the same time the added ideas of the lunar landscape were a fantastic springboard for their imaginations – there were lots of daring adventures happening and creative conversations taking place between our alien characters. This is an awesome playscape. I love the sparkly planets. My son would love those, he’s very into sequins at the moment. Can I ask how many packets of waterbeads you used? It looks like a lot. I bought one jar from hobby craft and I’m interested to get an idea of how big a tub i’ll need once they are swelled with water. I’ve been putting off using them until i can find a suitable vessel to contain them. Hi The Monko. We have three 99p size packs in this tub – less a few which were lost last time we played. I haven’t measured the box but maybe the pieces of card give you an idea of how big it is – about 1 A4 size wide by about 2 1/2 A4 size wide. Hope that helps – and we would love to see yours if you do make one. My pleasure Helen – hope your son has lots of fun with it. 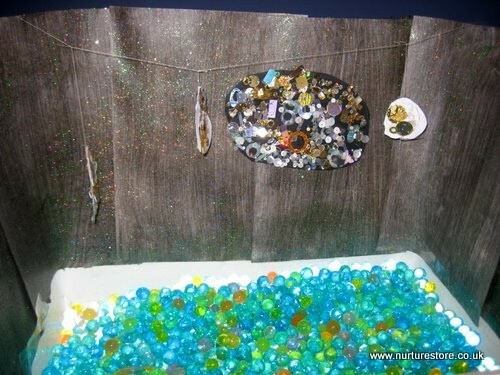 What a great sensory tub adventure incorporating water beads! We linked back to you in our latest water beads post (we reversed the process and shrunk some beads). We’re also having a fun giveaway. Thanks! Just linked up Liz – thanks for the invitation. I keep wondering… Has anybody ever tried out water beads with milk? Would they absorb the milk as they absorb water and get a nice milky look? Thanks for all the great ideas delivered to my inbox every week! Ooh Sheri – that sounds like a great experiment to try! Let me know what you discover!